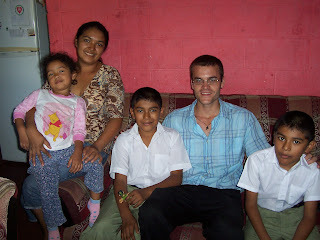 My friend Danny Burridge has lived and worked in El Salvador for the past 4 1/2 years. Recently he started a new blog titled Embracing Crisis, about some of his experiences. Danny states that his purpose in writing the blog is "to incite awareness and weave a better world." It's traditional at year end to review the lives of famous persons who dies in the preceding 12 months. This year, a death mourned by thousands of Salvadorans was the death of Manyula, the old Indian elephant in the San Salvador zoo. Perhaps the Salvadorans’ fascination with Manyula had to do with the attraction between opposites. Maybe it was the wonder that the sight of the gentle giant evoked in a country nicknamed the “Tom Thumb of the Americas” because of its shape and size. To generations of Salvadorans, Manyula was a symbol of serenity and permanence, a calming and benign presence amid the natural disasters and political upheavals that claimed thousands of lives. “My grandmother first brought me to see her. I had been visiting her for the past 43 years,” a woman told a local newspaper. It is one of the perpetual themes of life in San Salvador --the clash between street vendors and the municipal government which wants to impose some order on the stalls which clog the streets and sidewalks of the city's historic center. Since June, the mayor has ordered the forced eviction of 1,053 hawkers, as part of an attempt to regulate street vending in a city where more than 16,000 street vendors hawk their wares, occupying many streets and plazas. Several of the evictions, which form part of what the metropolitan police has dubbed "Operation Thunder", have ended in pitched battles, with dozens of people arrested or injured. This year, tragedies in Mexico have brought the public's attention to attacks on migrants crossing Mexico on their way to the US. Another high profile attack took place on December 16 as gunmen kidnapped as many as 50 Central American migrants stowed away on a freight train in southern Mexico. The incident has further strained relations between El Salvador and Mexico since Salvadoran officials believe Mexico is doing to little to investigate or prevent such crimes. The director of a Catholic shelter for migrants, Father Heyman Vasquez... told BBC Mundo that he had spoken to some of the migrants who reported escaping the kidnapping. He said that 92 out of some 300 migrants on the train had been arrested by migration officials, but that shortly afterwards, the train was stopped by unidentified gunmen. After the Mass and the First Communions, we fixed up two tables really nice. They were kind of long tables with white tablecloths that hung down to the floor. The children who had received their first communion sat at one table, with Monseñor at the head. The rest of the community sat at the other table. Tamales had been made. "Two apiece!" said the women who were handing them out. There was one regular tamal and one sweet one for everyone. Suddenly a little boy appeared out of nowhere. He was a tiny little kid, about four years old. Light haired and covered with dirt. Barefoot, and with a nose full of snot. He came up to Monseñor Romero from behind and pulled on his cassock with his grubby fingers. "You want some?" Monseñor asked him. From a giant billboard in the Salvadorean capital, a man with a defiant attitude shows off a slogan on his shirt: "No one can intimidate El Salvador," it reads. The ad - part of a government-funded anti violence campaign - holds a special significance at the time when many worry that an overflow of Mexico's drug violence could soon hit this small Central American nation. The first one to raise the alert was President Mauricio Funes himself, last April. "We have information that they [the cartels] have entered El Salvador with exploratory purposes," President Funes said. Because of what he described as the "effectiveness" of Mexican President Felipe Calderon's policies, the cartels were looking at new bases for their operations, he added. Linda of Linda's El Salvador Blog gave me permission to republish her recent post on popular Christmas culture in modern El Salvador. Holly Jolly Christmas We were driving through a holiday lights display, laughing at the animated images of Santa in his workshop and the bears in the bakery. With the fresh blanket of snow all around us, the lights were especially pretty. "When you were a little girl, did you celebrate Christmas with the story of Santa Claus?" I asked my friend from El Salvador. It was her second visit to the US - her first time in the snow. The proposed law will limit certain practices of the sugar cane plantations, including indiscriminate pesticide and fertilizer application, deforestation and burning before the harvest. It was written the help of legal expertise from the University of El Salvador and has the backing of eight coastal government districts and many community organizations. One of the blessings I have received as a consequence of writing this blog is to get to know an organization named the Volunteer Missionary Movement or VMM. In fact, the organization so impressed me that I now serve on its Board of Directors. VMM makes it possible for people to volunteer in poor communities in El Salvador and the rest of Central America. VMM volunteers make a two year commitment to volunteer as a way of living out their calling as Chistians to be of service to the poor, the homeless, and the marginalized. VMM places these dedicated volunteers with project partners doing such things as promoting community development in Usulutan, working with at risk youth in gang-ridden neighborhoods of San Salvador, leading a pre-school program in a poor neighborhood in Mejicanos, connecting North Americans in solidarity relationships in communities in El Salvador, or teaching indigenous women in Guatemala principles of animal husbandry. Whenever the Public Opinion Institute (IUDOP) at the University of Central America releases a new public opinion poll, it's always worth a read. 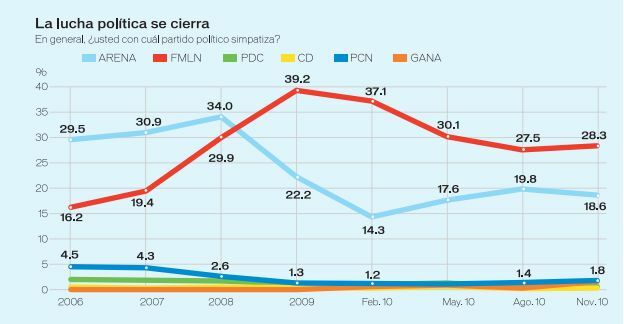 But there's not much surprising in their most recent poll: Salvadorans' biggest concern is safety and crime, and Mauricio Funes continues to enjoy high approval ratings as the country's first president from the left. Answers to questions from the IUDOP show that Salvadorans are pessimistic about the economy. More than 50% believe the economy worsened and that poverty increased in 2010. Only a quarter believe that things will improve next year. Perhaps the most striking result is that Salvadorans believe that the police are doing a good job in combating crime in the country. 60% of Salvadorans polled felt that the PNC has gotten more effective in dealing with crime. 58% believed that the government's security plan was starting to show results. As US State Department cables continue to come into the public domain via WikiLeaks, five cables have recently been published by the Spanish paper El Pais coming from the US Embassy in San Salvador. The cables are reports back to Washington on current events and the political environment in El Salvador in 2009 and 2010. The cables are all written by Robert Blau, who as Charge d'Affaires was the senior US official in the Embassy prior to the arrival of current US ambassador Aponte. His clearly-written cables give an insight, not usually available, into the issues the US finds of importance in El Salvador. The trial for the murder of Salvadoran politicians in Guatemala in 2007 came to a conclusion last week. But the conviction of several suspects raises as many questions as it answers. An article in ContraPunto with the headline "Obscurity and Doubt Hang Over the Case" captures the state of information about the case. Thirty years ago this week, right wing death squads and the Salvadoran military, and the oligarchy they were protecting, made it abundantly clear that there were no limits to the violence they would wield against opponents. First, on Thursday, November 27, 1980, six leaders of the Democratic Revolutionary Front (FDR) were kidnapped from a school where they were meeting, tortured, and killed. Their bodies were dumped along a roadside later that same day. The FDR had been a broad opposition coalition which represented many sectors of Salvadoran society. The murders drove the FDR to align itself with the armed movement which was the FMLN.